For some it’s chocolate covered strawberries. For others it’s a nice short glass of Louis XIV. For me it’s beautiful soft hand dyed yarn. My LYS, Patricia’s Yarns just got their first shipment of Malabrigo and I couldn’t be happier! It comes right at the moment that I finally finished a long blogless project. I can’t even tell you what kinda of knits I just want to dive into right now. Some I’ve already written about – others have just popped into my crazy knit filled head today. Knowing I just HAD to start a Malabrigo project I casted on the A Better Bucket hat that has been popping up a lot in my Friend Activity on Ravelry. I’m just past the provisional cast on (so fiddly!) and am just on the rim right now. I haven’t made a hat in a long time so it’s nice to have a smaller project on the needles. 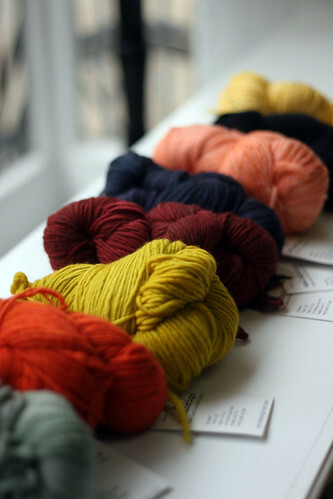 Obviously you know my feelings on Malabrigo – it’s just so soft! And to think…. I have access to a huge stash of Malabrigo only a mere block from my apartment. ahhh how cool is that! Look at you with your new friends:) I love the Better Bucket hat, I’ve been wearing mine all week as it’s perfect bucket weather! I’m drooling over that Mmmmmmmalabrigo photo. Lucky you. Ooh, gorgeous true solids! Want! I love that picture. It sums up Malabrigo in a single shot!!! 🙂 Super cuddly!!! Oh, for the feeling of new yarn. It is wonderful! Oh yeah! Look at all that goodness! definitely a reason to smile! amazing! Oh that last pic makes me smile. So snuggly. Definitely dive into some instant gratification knits with it. I’d be hugging it too! You are so cute. MmmmmMalabrigo, indeed.